Celebrate and dance with a Paul Taylor Dance Company "star"
Our friends at Paul Taylor Dance Company are offering adult classes beginning this weekend. The 15-week session begins September 24, and will be held on Saturdays from noon – 1:30 p.m. The class is being taught by former Taylor dancer Raegan Wood and is designed for dancers and non-dancers alike. Come kick up your heels at the festivities. Visit www.ptdc.org to learn more about participating. It has been nearly 80 years since Teresa Deevy’s play won the Abbey Theatre’s New Play competition, but “Temporal Powers” still packs a wallop. Set in a small impoverished Irish town in the 1920s,”Temporal Powers,” currently in a production by The Mint Theater Company under the direction of Jonathan Bank, closing 25 Sept., extended to October 2nd 9th was deemed ”strikingly original and of fine literary quality” by the Abbey judges. Money and the lack of it are powerful tests of any marriage, but the Donovans have such a completely different sense of right and wrong that it is not just their homelessness that can tear them apart. Michael (Aidan Redmond) is a fiercely moral man, so madly in love with Min (Rosie Benton), his wife of ten years, that she can bend his senses in any number of ways. Michael is content to toil without enriching himself, for the pride of accomplishment. But unlike Michael, Min feels entitled to a better life. And she is not sure that she will get it just being his wife. The plot of “Temporal Powers” subtly twists, asking questions about fairness, and loyalty, as it makes its way around the rich cast of nine characters. The troupe all handle this intelligent material ably. Eli James, along with the leads, gives a particularly admirable performance as Michael’s true friend, Moses Barron. Thanks to the workings of the dialect coach, Amy Stoller, everyone’s speech is convincingly country Irish, yet easy to follow. 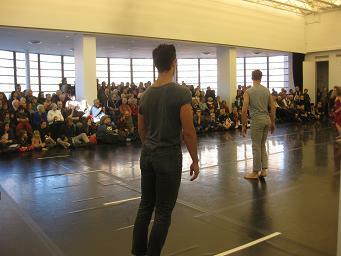 Please visit http://www.minttheater.org/ to find out more about “Temporal Powers” and The Mint’s Deevy Project. “Temporal Powers” is part of the 1st Irish Festival 2011. William (Willy) Hayes (Jered McLenigan), a playwright spoofing William Butler Yeats and perhaps William Fay, is on the verge of the debut of his great Irish play, “The Wooing of Emer,” at The Irish National Theatre of Ireland. He also hopes to give his Theatre a permanent home through his benefactress, Eva St. John (Megan Bellwoar). 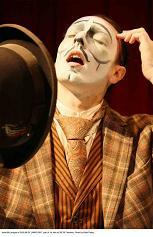 .Jered McLenigan as Willy Hayes in a photo by Katie Reing. 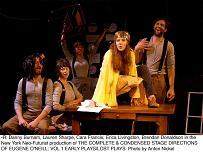 “Dublin By Lamplight,” at 59E59 Theaters through October 2nd is art of the 1st Irish Festival, a four week theatrical celebration of Ireland, and “The Wooing of Emer” is the play within the play. “Act for Ireland,” Willy tells his brother Frank (Jared Michael Delaney), who takes this exhortation as a cry for revolution. Willy intends it in a less political and more artistic way; his spectacle (“The Wooing of Emer”) honors Ireland’s legendary hero Cuchulain. All will fall apart for Willy and his dreams for a National Theatre on the eve of the King’s visit in Dublin in 1904. Eva, the Emer in his play is arrested for her part in protesting against the English King and with the Daughters of Erin. 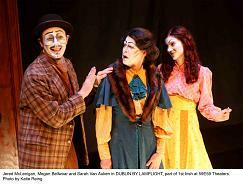 Jered McLenigan as Willy with Megan Bellwoar as Eva and Sarah Van Auken as Maggie in a photo by Katie Reing. “Dublin By Lamplight” is a commedia dell’arte piece in which each of the characters, made up with mask-like faces, explains himself in the third person as he goes about on this fateful day. Michael West, the playwright of “Dublin By Lamplight” aptly describes the play as a “silent movie with dialogue.” Adding to this silent film effect, it is set to piano music composed and performed by John Lionarons. Ireland would realize a National Theatre (The Abbey Theatre) long before it would achieve nationhood. 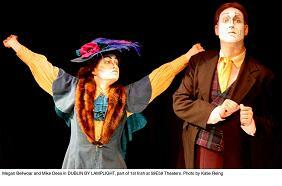 In “Dublin By Lamplight,” the Irish struggle is both comic and poignant. 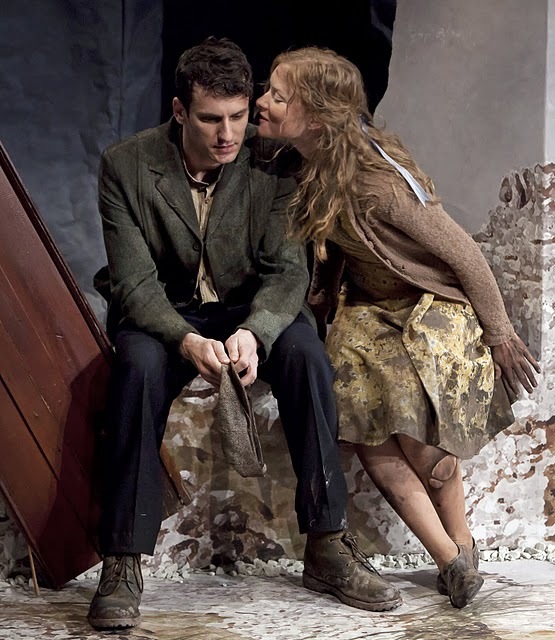 Megan Bellwoar as Eva and Mike Dees as Martyn Wallace in a photo by Katie Reing. Please go to www.59E59.org for a schedule of performances and to 1stIrish.org to learn more about the 1st Irish Festival. Lessons in Fight: "Captain Ferguson’s School for Balloon Warfare"
Obsessed with flight, possessing navigational skills and knowledge of the skies, and mathematical proficiency, Captain Ferguson devises a plan, on the eve of battle against the Germans in WWI, for a great dirigible attack. 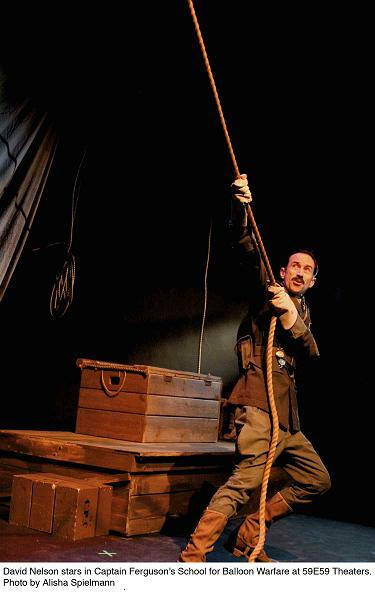 “Captain Ferguson’s School for Balloon Warfare,” an Oracle Theatre production at 59E59 Theaters through September 4, is about zealous patriotism, heroics, and the single-minded futility of war. 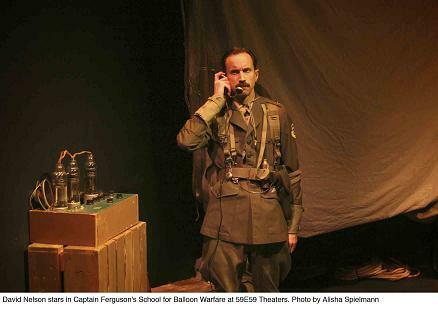 In Isaac Rathbone’s “Captain Ferguson’s School for Balloon Warfare,” based on actual events, it is 1917 and U.S. Army Captain Thomas Ferguson has been asked to turn aerial balloons into a weapon against Kaiser Wilhelm. The character of Captain Ferguson is inspired by Captain Charles deForest Chandler, the first head of the Aeronautical Division, U.S. Signal Corps –later to become the United States Air Force. video projections and radio communications that add other voices to his story. These voices include his right hand man, Lieutenant Archibald Prentice, and three skeptical Generals. “Have you realized,” a General asks, “that these men are helpless, Ferguson?” However, having proven their usefulness in reconnaissance, Captain Ferguson also proposes to use the large canvas balloons to bombard the enemy line, and stubbornly ignores the challenge of his superiors. David Nelson acquits himself well as the dedicated and sincere Ferguson, but the play is merely an exploration of a moment that ended in failure and not a full-blown theatrical creation.